Pamper yourself, or give the gift of iYURA, a skincare combo that will nourish your skin and make it glow. As we age, our complexion goes through a lot of transitions. Our collagen production slows down and we start noticing wrinkles, stress lines, some sagging and those dreaded age spots. Aging is inevitable, but caring for our skin and using only high-quality skincare products will allow us to age gracefully. 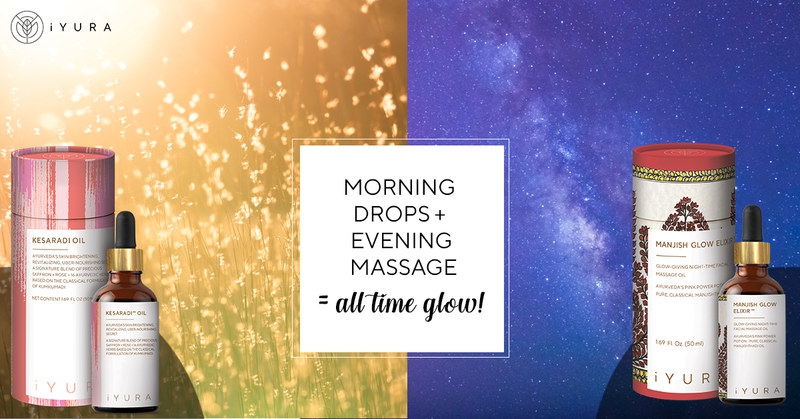 We need to replenish our skin with vital nutrients both day and night and iYURA has the perfect set. Our skin’s needs will differ from morning to evening so we need to vary our products. During the day our skin is exposed to the wind, dirt, environmental toxins and pollutants, makeup, bacteria and UV rays. These factors will have a harsh effect on our skin, so proper daily cleansing and moisturizing are imperative. During the evening, our skin kicks into repair, recuperate and restore mode and will release excess sebum that has accumulated overnight. An organic gentle cleanser and restorative oil like Kersaradi Oil are needed to rebalance our skin. The iYURA Day & Night Skincare Combo comes with Kesaradi Oil and Manjish Glow Elixir for both your day and evening skincare regime. Every morning use Kesaradi Oil to brighten, revitalize and nourish your skin. It’s gentle, effective and includes a special blend of Rose, Saffron, Turmeric and 16 potent Ayurvedic ingredients. Saffron is the most expensive spice on the market because harvesting it is labor intensive. Saffron has antioxidant, anti-inflammatory and antifungal properties and contains vitamins B2, B3, B6 which are excellent for enhancing your complexion and even your skin tone. Plus this oil works harmoniously with all three doshas. Rose is calming and soothing, a lovely coolant and promotes a clear complexion. Turmeric has anti-inflammation and antibacterial properties and is a great antiseptic for cut, burns, and bruises. It’s good for acne and reduces scarring caused by this skin condition. It helps treat psoriasis, prevent wrinkles, minimizes stretch marks, and improves overall skin tone. To use the Kesaradi Oil, apply 3 drops to the palm of your hand and massage in upward circular motions on your face and neck every morning. It’s a lightweight, non-sticky oil that locks in moisture and creates a protective barrier. It will leave your skin soft, supple and radiant. The Manji Glow Elixir is made from a blend of Indian Madder, Wild Lemon and Butter Tree. These ingredients pair well to work on dull, uneven skin tone and patchy skin. Indian Madder is loaded with antioxidants so it’s a great anti-aging herb. It cures acne, reduces inflammation and wrinkles, heals damages skin and cleanses the skin, leaving it with a youthful glow. After cleansing and toning, add 4 drops or more depending on your skin’s needs, in the palm of your hand and gently dab on your face, neck and decollete. Massage for several minutes in upward and outward until completely absorbed. 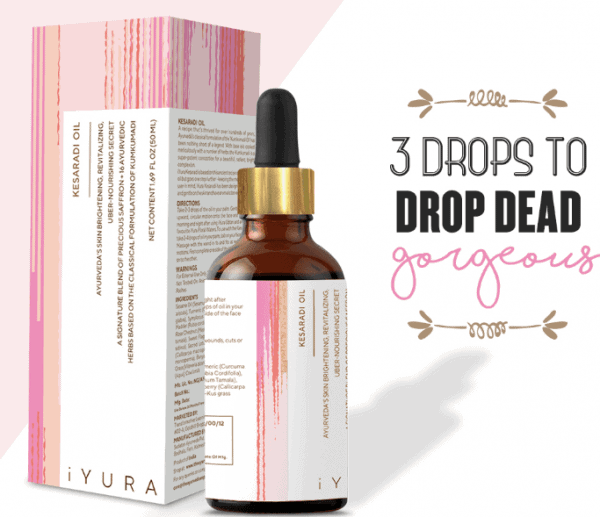 The iYURA Day & Night Skincare Combo is on sale until Feb 5, 2019. Let this vibrant skincare set work for your skin, leaving you with a dewy, youthful complexion.